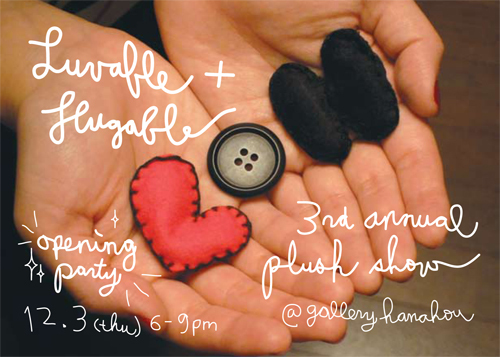 Right after Giveaway Day has commenced, the Luv-able + Hug-able show opens on the 3rd. If you're able to make it to Gallery Hanahou, do go see the show, it'll be awesome! New 2009 theme: medium and mini! 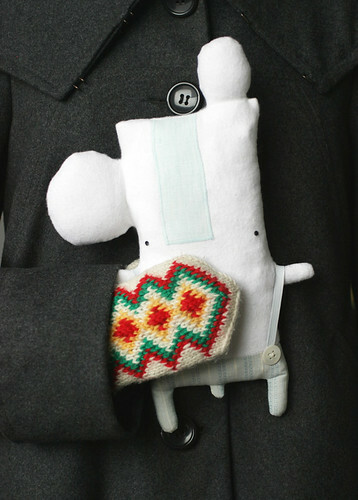 The popular NY holiday plush show is returning to gallery hanahou with oodles of handmade plushes for you and yours! Spread warm holiday cheer with adorable, strange, and funny unique plush toys made by more than 50 top plush artists from around the world. The plushes will be even cuter and more affordable at this year's 3rd annual "Luv-able and Hug-able," with the special theme of "Medium and Mini! 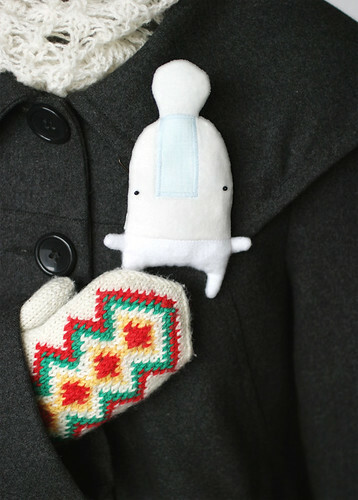 ": toys that are either just the right size for hugging or small enough to fit in your pocket, swing from a keychain, or be worn on a pin. Many favorite artists from the past two years are returning with cuter-than-ever plushes, and gallery hanahou is thrilled to present plushes from a bunch of hug-able new artists too! As in previous years, the gallery will also exhibit plushes by Japanese artists whose original works are rarely available in the US - this year, that also includes designer toy giants Devil Robots and noriya takeyama! 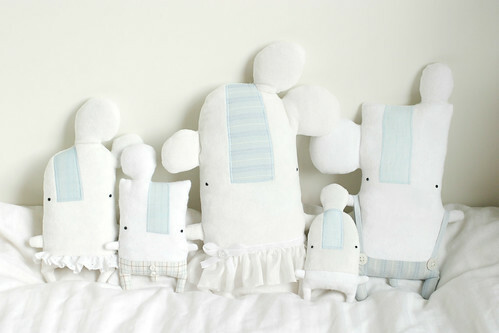 Plushes will be available for immediate take-home, so come early to the December 3rd opening to nab your favorites! Items in the show will also be available online via galleryhanahou.com starting the week following the opening. 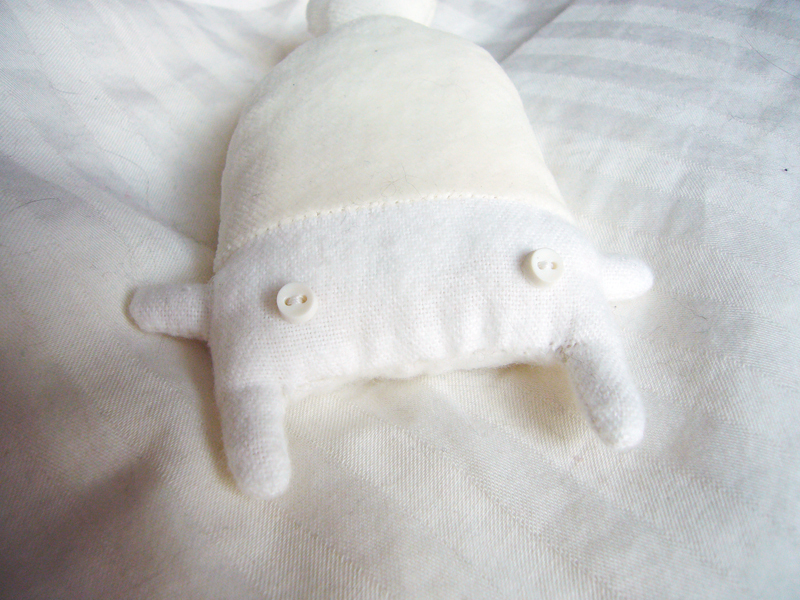 So, so many amazing plush-artists have their work on show (and for sale too!) there, including such great plushie-makers as Christina Gordon (Jam Fancy), Sandra Monat (herzensart), Hine Mizushima and Tania of Super Ninon and many, many others! I'm incredibly honoured to have my rag-snowflakes rub shoulders with such famous artists! After all this, I have parties to attend almost every week the whole month, friends and family to visit too and to top it all off, Christmas things to prepare as well! I don't mind being busy though, I like the holiday season and I really enjoy Christmas and all that goes with it so having Christmassy things to putter about with is a joy. First snow fell here last night and by coincidence, my rag-snowflakes arrived in New York the same time! The snow continued falling here through the night and only let up just now. Everything is beautiful and white and the there's an almost christmassy mood about. Inspired by the actual real snow, here's some more photos of the rag-snowflakes I made for the Luv-able + Hug-able show. Snowflake no. 1 is an unique medium snowflake. 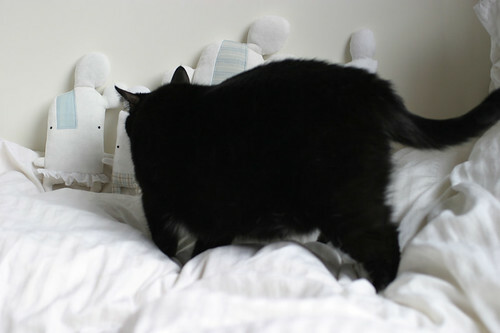 She's 35 cm tall from the top of her blobs to the tip of her toes. 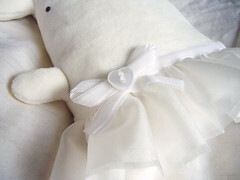 She's made out of cotton velvet and linen and she has an appliqued stripy cotton nose. 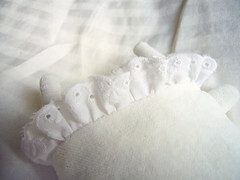 Snowflake number 1's eyes are little buttons and she has a pretty frilly silk skirt with a velvet ribbon waistband and a decorative pearly heart-shaped button. Snowflake no. 2 is an unique smallish snowflake and he's 30 cm tall from his blobs to his toes. 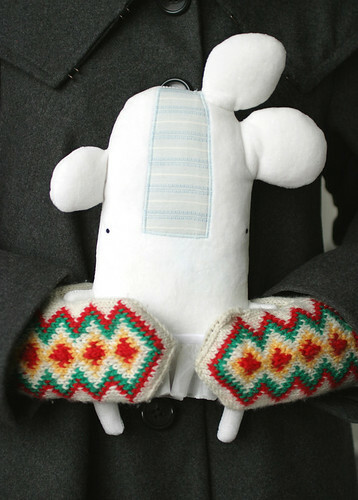 He's made out of cotton flannel and has dapper stripy cotton trousers with elastic band suspenders and mother-of-pearl buttons. 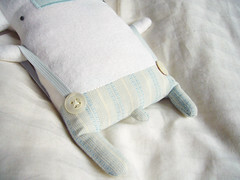 His nose is appliqued linen and his eyes are little buttons. Snowflake no. 3 is an unique small snowflake and she's 25 cm tall from top to toes. She's made from velvet and linen and she has a cute cotton eyelet-lace skirt. 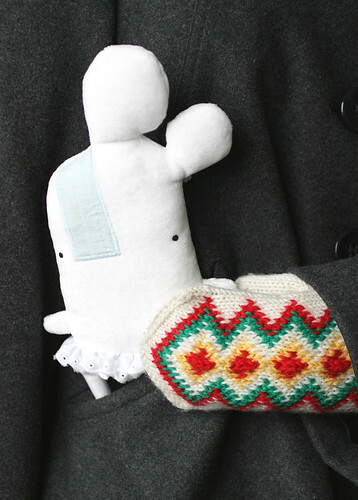 Her nose is appliqued plaid cotton and her eyes are little buttons. Snowflake no. 4 is an unique little snowflake. 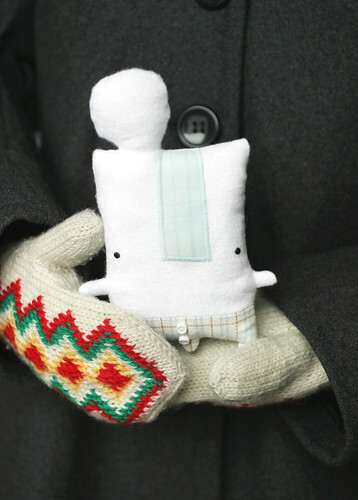 He's 20 cm tall and he's made out of cotton flannel. 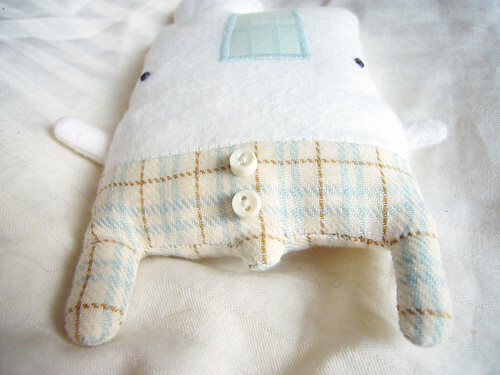 His nose is appliqued plaid cotton and his eyes are little buttons. Snowflake number 4's smart plaid pants have two decorative buttons on them. Snowflake no. 5 is an unique tiny snowflake and she's 15 cm short from her toes to the top of her blob. She's made out of velvet and she has an appliqued linen nose and little bead eyes. She's wearing cozy flannel pyjamas with two buttons on the back. 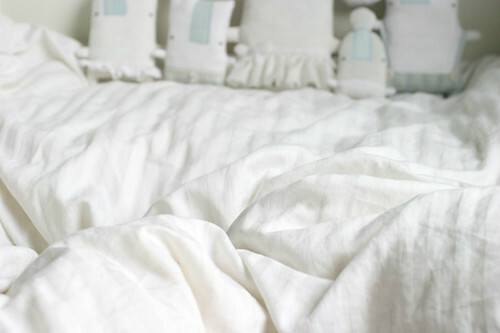 All of the snowflakes are stuffed with rags (torn up old sheets) and wool and love. They will be for sale at the show at Gallery Hanahou, should any of you want a snowflake of your own to hug. This little flurry of rag-snowflakes is currently flying over to New York for the Luv-able + Hug-able show. The theme of this year's exhibition is "Medium & mini" and the show opens in December, so I thought that a group cuddly snowflakes of various sizes would be fitting. I wanted to do something a little different, and after drawing lots of design sketches, drafting some patterns and making a few mockups, I ended up drawing each flake completely freehand. This makes each so utterly unique that not even an individual flake's bits match! Each flake is filled with rags and as the weather in winter tends to be cold, instead of cotton batting I used lovely warm wool. Since we don't have any snow here yet, I made a snowdrift out of our duvet for the photo. I'm not too keen on the weather we have right now, the beautiful colours of autumn have all faded as the trees have shed their leaves, and everything looks very drab and grey. I'm eager for snow to fall, it brightens these dreary days and makes the whole world look so new and clean and sparkly. I'm hoping my snowflakes will brighten peoples' mood just like real snow does to the landscape.